Audio hardly gets more immersive than what you get with surround sound. Sure, stereo is enough to give a decent sense of direction and virtual surround. It can also efficiently emulate a true surround experience when combined with good headphones, but nothing quite compares to the real thing. 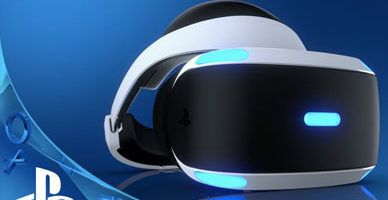 If you’re interested in getting your very own surround system, here is our selection of the very best pre-made surround sound systems for gaming. The list includes multiple solutions across a fairly wide price range, so everyone will find a good fit for their budget. 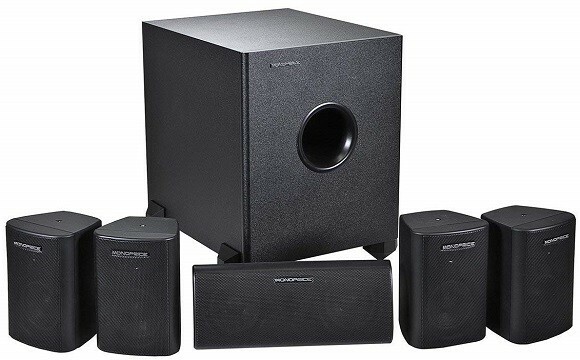 The first on our list is a simple and affordable surround sound system from Monoprice. As you may have guessed, they are hardly a prestigious audio equipment manufacturer, but after all – we’re not looking for superb quality in a budget product, merely good value. It is in this regard that this Monoprice surround sound system truly excels. It is by far the cheapest system in this category that will offer satisfactory sound quality at a low and highly approachable price. Unless you have overly unrealistic expectations, Monoprice’s surround system will not leave you disappointed. The speakers perform well, and even the subwoofer is decent, although it is not exactly capable of hitting those thundering lows. But of course, we can’t have a good budget product without some corner cutting, and in this case, the main target of corner cutting was the build quality. The exterior does not exactly give off an aura of longevity, and the durability of individual speakers is also questionable, although Monoprice is, reportedly, very quick to replace faulty speakers. 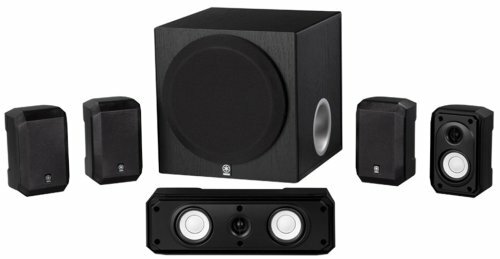 With that said, while they are no competition for high-end products made by some of the more recognizable industry names, Monoprice has the casual budget-conscious users covered with this affordable surround system. Up next is another relatively inexpensive solution, only this one comes directly from Yamaha, a highly respected name in the audio world. And what can you expect from a Japanese company that’s been around since the 19th century? 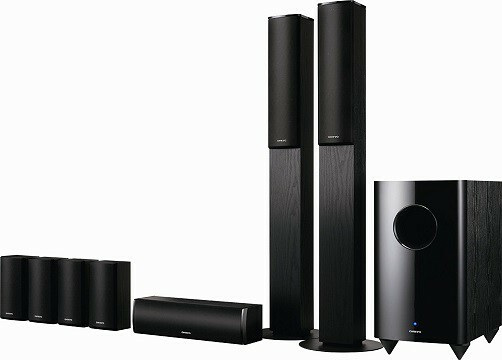 The Yamaha NS-SP1800BL is a solid and inexpensive surround system whose primary strength is its subwoofer. It can reach frequencies quite a bit lower than the Monoprice one, that much is obvious from the specs. The speakers don’t really do it justice, though, as they are prone to audio distortion when the volume is cranked up, and they don’t really fill up the room as well as some pricier speakers might. In the end, if you’re looking for an affordable surround system and the bass is what you care about the most, then this set of speakers from Yamaha will surely suit your needs well. On the other hand, if you want clear, high-quality full-range audio, we’d suggest going with something a bit pricier, as the speakers that come with this set are hardly state-of-the-art. Even though they haven’t been around nearly as long as Yamaha, Logitech is one of the top companies to go to today for a variety of computer peripherals, speakers included. Hence, we have the Z906 surround system. Both the subwoofer and the speakers give off a definite air of quality, that’s for sure, but is the sound up to par? Well, it most definitely is! The subwoofer blows the previous two out of the water, and it can truly hit those palpable lows. The satellites fare no worse either, albeit the high-end is not as clear nor as rich as the lows and the mid-range. As a bonus, the Z906 comes with a convenient console and remote control for easy audio adjustment. All in all, the Z906 is an excellent low-profile surround system that is suitable both for PC and living room gaming setups, as the speakers are small and inconspicuous but still quite powerful. Ultimately, even though the high-end leaves something to be desired, the Z906 presents great value overall. Onkyo may not quite be a household name, but the company specializes in home cinema and audio equipment, so that should be a good indicator of the kind of quality that you can expect. The Onkyo SKS-HT690 is a high-quality 5.1 surround setup comprised of speakers that not only provide superb surround experience, but they are very well-built to boot, ensuring that they will last a long time. On top of that, each of the speakers sports a sleek glossy exterior that will lend a dash of elegance to any room. But there must be some drawbacks, right? Well, sadly, Onkyo seemed to focus more on the speakers than on the subwoofer when it comes to this set, so the latter performs a bit worse than what you’d usually find in this price range. At the end of the day, the Onkyo SKS-HT690 is a highly reliable surround sound system that is entirely capable of putting out rich full-range audio with its combination of mid-range speakers, tweeters, and the dependable, if somewhat underpowered subwoofer. Next up is another surround system from Onkyo, which is a slight upgrade over the one above. The SKS-HT870 is not only a 7.1 surround system, but it also brings a subwoofer that is more than twice as powerful as the one shipping with the HT690. On top of that, the speakers also come set in proper wooden enclosures, something that definitely gives them some extra aesthetic appeal. Still, this is not the most inconspicuous setup out there, as the speakers and the subwoofer all sport a rather bland and “boxy” design that does not exactly mirror the sound quality that you’d be getting with this set. Regardless, for those who prioritize performance and affordability over aesthetics, the HT870 will be a great match. It is one of the cheapest 7.1 systems available that manages to deliver good overall sound quality, and in our book, that’s a winning combination. If you thought the above system seemed good, wait until you see what else Onkyo has in store! The Onkyo SKS-HT993THX is a clear step up both in terms of quality and pricing, that much is certain from the fact that the system is THX-certified. With that said, what you’re looking at here is a surround system that can offer superb full-range audio experience, and even though the subwoofer has relatively low output power, it makes up for it in sheer size and is wholly capable of hitting those thundering lows. As you might have guessed, the biggest drawback to this system is, of course, the price. And indeed, it is the most expensive surround system featured on this list, so it may not be a good fit for everyone. Nonetheless, it is still a decent price, as far as 7.1 systems go, so if you do opt to pick this system for the sound quality and don’t mind the same uninteresting design also seen in the previous system, then the HT993THX would be a great choice. RMS – Does It Matter? One of the most standout entries on any speaker’s specification sheet is RMS. 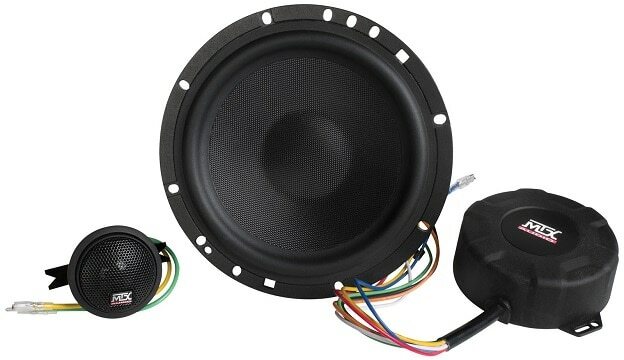 In essence, RMS does not in any way determine sound quality, but merely how loud a speaker can be and how well it will hold up when the volume is cranked up. When the volume on low-RMS speakers is turned all the way up, there is bound to be noticeable audio distortion. However, all of the speakers and subwoofers listed are more than powerful enough to fill up all but the largest rooms, so RMS shouldn’t be on top of your checklist when you’re shopping for home surround audio solutions. As you can see, our list includes surround sound systems that utilize both 5.1 and 7.1 configurations, which are also the most common configurations for home surround systems. Well, the only real difference is the number of speakers – five and seven respectively, plus one subwoofer. 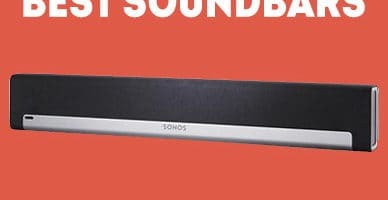 Granted, there are other surround systems that utilize more speakers and multiple subwoofers, but those are usually quite expensive and are simply an overkill when we’re talking about surround sound systems for home use. 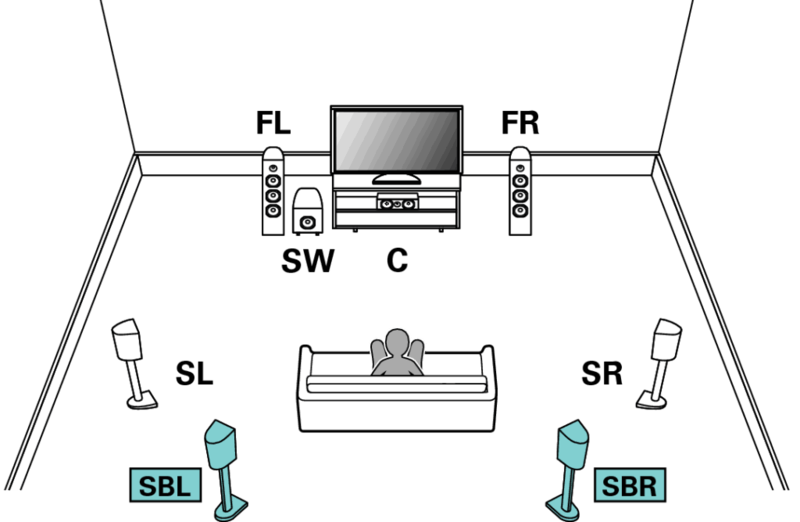 A 5.1 system is quite straightforward: the center channel is placed right in front of the TV, two speakers are placed on either side of the center channel, and two additional speakers are placed on either side of the listener. A 7.1 system adds two additional speakers that make it possible to have four speakers placed around the listener, two on either side and two behind, as seen in the picture below. Needless to say, this can noticeably enhance the surround experience. So, which should you pick? For starters, there’s the price to consider: a 7.1 system will usually be more expensive than a 5.1 system, and if they’re not, the more expensive 5.1 system is bound to include higher-quality speakers. Another advantage of 5.1 systems is that they also take up less space and are easier to set up, plus they don’t really require you to have extra space behind your listening point i.e. chair or sofa. On the other hand, if you have the money to spare and enough space for all the speakers, the two extra speakers that come with a 7.1 system can make a world of difference in terms of immersion. At the end of the day, if we had to pick favorites, our top choice would have to be the Logitech Z906. 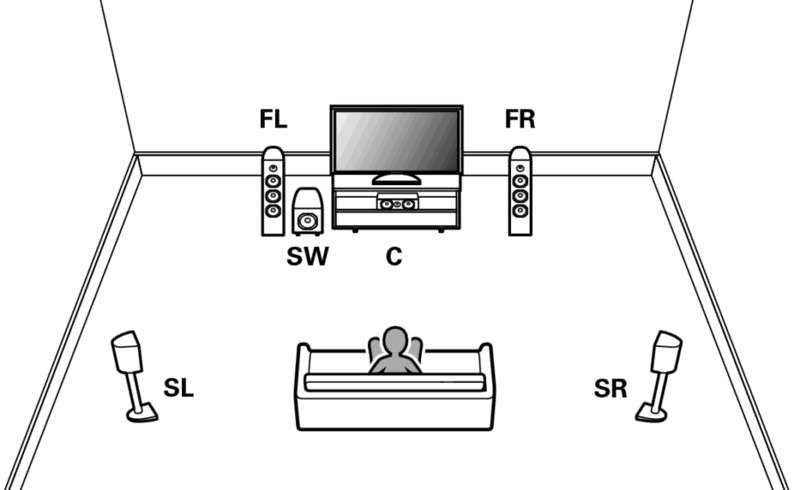 Simple because we find it to be the surround system that offers best overall value, especially for gaming. True, it’s not the best surround system ever made, but the fairly small speakers can fill up a medium-sized room quite nicely, not to mention that their diminutive size also makes them great for smaller rooms and smaller gaming setups. But as always, that is only our pick. In truth, any of the surround sound systems listed here would be a good buy, provided that you make a choice based on your needs and budget.